As a fellow fan of Ryukishi07’s works (Higurashi no Naku koro Ni, Umineko no Naku Koro Ni), I was quite excited for the release Ookami Kakushi. I thought that I was in for another psychological thriller and exciting mystery, but unfortunately, Ookami Kakushi didn’t turn out to be as such. I admit, I went into the show with the wrong kind of expectations, and my review is a reflection of that. However, I still think I have some good points to offer. The first half of the series suffers from no development. Our main protagonist, Hiroshi, moves into a new town with his father and sister, attends school, and meets new people. However, something never feels quite right. A female classmate of his becomes extremely attached to him, a mysterious girl neglects him, and a few classmates begin to disappear without notice by others. At the end of each episode, we catch a small glimpse of a terrified person running away from a group of supernatural, masked beings who are after that person’s life. While you know something is up and you’re curious, what you’re mainly going to see is Hiroshi participating in ordinary slice-of-life activities and interacting with a small cast of characters. Aside from a few weird events befalling Hiroshi, nothing much changes, and this becomes dull fast. The second half finally explores the mystery behind the masked beings, but it still moves incredibly slowly for such a short series. What you have next is a string of predictable events, coincidences, and episodes dedicated to simply feeding you all of the information. By the time the climax hits, it is downright disappointing. There are no major plot-twists or anything exciting to keep the anime’s head above the water. The finale is a joke. The characters feel one-dimensional. They hardly have any development. Only towards the end do the characters begin to show a different side to them, but their peak development is still not all that impressive. They just go back to the way they were before, falling very short of being dynamic. They are also not entertaining at any given point in the show beyond the introduction. Hiroshi is a shy and awkward kid who always feels nervous, but he has a sense of justice somewhere within him. His hobby is to stare at the other characters and do absolutely nothing. Hiroshi's sister, Mana, is bound to a wheelchair and we never get to find out why. Nemuru, his mysterious classmate who neglects him does only that for the first half of the series. Asagiri is another classmate who is just a walking encyclopedia, always trying to help clue Hiroshi in. And then we have Isuzu, his neighbor who instantly becomes attached to him. She just spends her time hopping around and clinging to his arm, quickly rubbing off as an annoying character. Lastly, the main villain is the typical, revengeful idiot type with a predictable outcome and is nothing special. You've seen these characters being used before again and again. The adults also have a role in the show, but they are even duller characters than the children. None of the characters stand out as being impressive, strong, or all that memorable, even by the last half of the show. At the very least, the character's backgrounds are somewhat explored, as there is a good reason for their initial behaviors. They could have had much more depth though. I do have to give credit for the OP song “Toki no Mukou Maboroshi no Sora” by FictionJunction for being pretty good. However, there is not much to say about the rest of the sounds. They contribute to the mood, but they're more or less on the average side. Ookami’s OST isn’t something that I would be dying to have. The animation is not weak, but it is not spectacular either. Perhaps the most noticeable aspect of the artwork is how beautiful the costumes look on the masked beings. The color and lighting effects are also used well for certain scenes and to show real depth in the character’s eyes. Overall though, the character designs are rather average, and there isn't much change in background scenery. I learned too late that Ookami kakushi is not meant to be a deep, plot-twisting mystery series. It is more about character relations, drama, mood, suspense, and slow buildup. But even with that in mind, the small cast of characters are for the most part unchanging and dull. This anime is mediocre and easily forgettable. 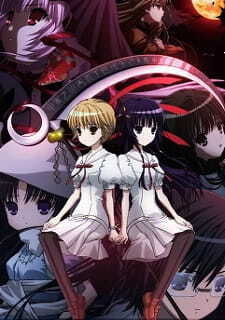 Ookami Kakushi was written by Ryukishi07, best known for Higurashi no Naku Koro Ni. That should pretty much tell you what to expect, since Ookami Kakushi is an obvious, shameless clone of its considerably superior ancestor. The premise goes as follows. Hiroshi Kuzumi, an unlikeable, spineless milquetoast, moves to a town known as Jouga with his occult fanatic father and annoying Tsundere sister, who is in a wheelchair for reasons that are never given passing explanation in the series. As they are moving in, Hiroshi meets the love interest, Isuzu Tsumuhana, who is supposed to be this series' Rena Ryuuguu despite having none of the likeability or humour that the Higurashi character possesses. For some bizarre reason, Isuzu is obsessed with Hiro, and the rest of Hiroshi's new class follows suit. However, one of them seems a little too attached, and begins to act strangely... then, we see a scene with him being killed by a girl with a scythe. The next morning, a girl who looks an awful lot like the girl with the scythe tells the class that he has "Transferred". Could it be that this town has a dark secret? If any of this is sounding familiar to you, then you've probably watched Higurashi, because this show is an absolute cut 'n' paste of it, only without any of the charm that made Higurashi great. It lacks the audience mindfuck that Higurashi gave us, completely misunderstands Higurashi's visual style, using all the creepy effects in all the wrong environments, and what seemed loveable there just feels stupid here. It doesn't help that almost every character here is completely unlikeable, being given little to no personality, backstory, or charisma, with only the villain having the latter trait making him somewhat likeable. And even that is hindered by the fact that his motivation is quite generic, and his plan makes no sense. On top of that, while Higurashi did a good job of tying up the loose ends (with only a couple of details left out, both of which were in the manga/VNs and relatively unimportant to the overall plot), Ookami Kakushi leaves several loose ends, for example, the aforementioned one with the wheelchair, and a character who is hinted to have some kind of disease that is never explained. The only thing that really redeem this show are the aforementioned antagonist, a relatively decent soundtrack, and the 12th episode, which is a random self-parody special taking place after all the plot is said and done. While it does come off as an enourmous BLAM Episode, it's still considerably more enjoyable than the remainder of this highly sub-par series. Final Words: A shameless ripoff of Higurashi, with none of what made Higurashi good. I figured i'd give this a short review. Mainly because, I was very skeptical of checking this anime out because it has god awful reviews. Goes to show, I really can't trust weeaboos to have real opinions. Anyone who outright hates this anime, is a diehard WTC/Umineko fan. They expected a psychological thriller with some brutal gore. That really isn't what this anime was about, and thus...let the hate flow. Story: It's average. I had it pinned pretty quickly. It does start out slow at first, but it picks up in the later half. I can't say I was ever BORED though, it kept me interested or else I would have just dropped it. If you take it for what it is, you'll probably like it. EDIT: By the way, this is definitely half Slice-of-life. Not your thing? Don't bother. You'll be bored. Not the animes fault, just a preference conflict. Music: I really enjoyed some of the soundtracks in this anime. A lot of anime loses emotion because of a lacking OST, but this anime doesn't suffer that problem. I could accept ANY insult towards this anime, except a shot at the OST. It was well done, that's a fact. Art: This is another one that struck me when I read reviews. People knocking the art. That surprised the hell out of me. I don't know what trashy streaming site people watched this anime on, but the 720p BD episodes I have look pretty fantastic. The art is smooth, the effects aren't lacking, and there's a decent amount of detail. For the time of release, the art is very solid. Characters: I don't have much to say on this one. Every character has a role, and they stick to it. Not a whole lot of "change" goes on, except for one character I suppose. For a short 11 (technically 12) episode anime, I don't expect much more. Characters don't need to go through immense change to be well done. Overall: A decent watch. I don't feel I wasted my time watching through the anime. F*** the haters, if you think you'd be interested in this anime, watch it and judge for yourself. Don't let a bunch of bias idiots dumping on this anime deter you, you may just enjoy it. Until the end I couldn’t decide whether to like or hate this anime so that’s why I gave it the average score, 5. The story is what drew me in at first. It did have this air of mystery and some traditional elements in the feel of it, so it initially was very promising. But in a few episodes it became pretty weird and I was somewhat appalled by the evolution of it. Until the end it doesn’t manage to become deeper or more detailed, on the contrary it just starts creating more “mysteries” which, as I unfortunately predicted, it patched up rather messily in the end. It’s a pity though because it felt like it had some really good ideas to work with, but they where rather poorly executed. I was annoyed by almost every single one of the characters with the exception of this guy Sakaki which, though, didn’t have the airing time he deserved. I think the characters are memorable afterwards because of how annoying they are. Nice music, but its one of those times that I wish that such a good song, as the opening one by FictionJunction, isn’t wasted in such a forgettable anime… overall the sound was fine. The art is what catches everyone’s eye. And I believe it’s the main reason for watching this anime. I loved the use of different tones of red which was a significant color for the story. I just had something to wait for each week. It was good for passing the time, but I wasn't getting too hyper to watch it, sometimes it felt more like a chore. It could have done much much better with the original idea it holded, which was quite interesting nevertheless, but failed to persuade. This is one of those anime that you shouldn’t start unless you don’t have anything better to do, or just want to watch something without any deep thinking.